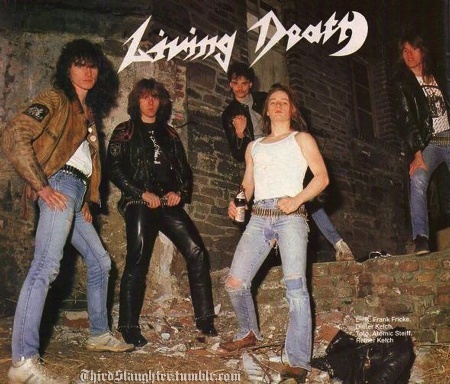 Living Death (1981-1991, 2008-present) is a Power Metal band from Velbert, Nordrhein-Westfalen, Germany. iving Death was formed in 1981 in Velbert, Germany featuring their original line-up of Thorsten Bergmann (vocals), brothers Reiner Kelch (guitar) and Dieter Kelch (bass), Frank Fricke (guitar), and Frank Schubring (drums). Starting out as a simple heavy metal band, a year later they recorded their self-titled demo, resulting in 1983 in a deal with 'Earthshaker'. Vengeance From Hell (1984), with Harald Lutze replacing Schubring, was an inauspicious start despite selling well on independent charts. The songwriting resembled a cheap early Metallica clone, and Thorsten "Toto" Bergmann's vocals were underdeveloped. The inclusion of Andreas Oberhoff on drums, after they fired Lutze, didn't help. The failings continued during much of their early releases, including Metal Revolution (1985) and the Watch Out EP (1985). The Back To The Weapons (1986) release saw Atomic Steif step in to take over drums. By the time 1987 rolled around, half of their career was over just when the band finally picked up steam and started producing some listenable albums such as the Mekong Delta-like Protected From Reality (1987), on the independent 'Aaarrg' label; the album featuring progressive thrash riffing. It turned out the Mekong Delta similarity was no coincidence, as it was later revealed that the two guitarists from Living Death were also the mystery guitarists in Mekong Delta, back in the time when Mekong Delta's members were all shrouded in mystery. Another line-up change commenced after the release of the 4 track live effort Live (1988; featuring works with Oberhoff on drums) with Frank Ullrich taking over drums full-time, "Fred" (guitars; who took over from Fricke) and Gerald Thelen on vocals. World Neuroses (1989) followed. Neither of which made a serious attempt at stardom. In 1989, Bergmann, Fred and Atomic Steif had left the band to form their own new band under the name Living Death (let's call them Living Death2), the remaining Living Death members with Reiner and Dieter Kelch continued their band with three new members. This situation lead to confusion, as both bands now had the same name. Living Death2 ended off changing their name to Sacred Chao (named after a Living Death song found on the Worlds Neuroses album) to release an EP before disappearing. The original Living Death, split-up after one more album, Killing in Action, in 1991, a posthumous "best of..." compilation, Living Death, (1994) 2CD and Thrash Metal Packet boxed set (2015) would follow. The band reformed in 2008 under the membership of Dieter Kelch (bass), Reiner Kelch (guitars) and Thorsten "Toto" Bergmann (vocals) but, other than the aforementioned box set, have been silent so far.